It’s a little after five in the morning and dawn is just a glimmer of hope on the eastern horizon, yet despite the darkness it’s beautifully warm. 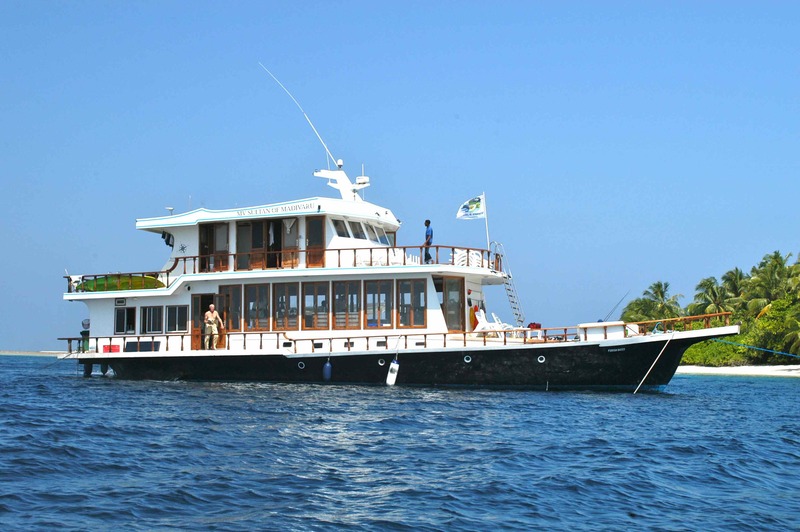 I am seated at the teak bow rail of the ‘Sultan of Madivaru’, my home for the week, savouring a steaming hot cup of freshly brewed coffee. I can see fruit bats the size of a large gulls hovering over the tops of the palm trees on the tiny uninhabited tropical island adjacent to our anchorage, and aside from the gentle throb of the boats diesel generators below deck, the only sound is an occasional splash as a bait fish gets nailed from beneath by one of the multitude of toothy predators that inhabit the rich seas around The Maldives. Life is good and as I enjoy my coffee while waiting for breakfast I find myself faced with something of a dilemma: what should I do for todays mornings fishing session? 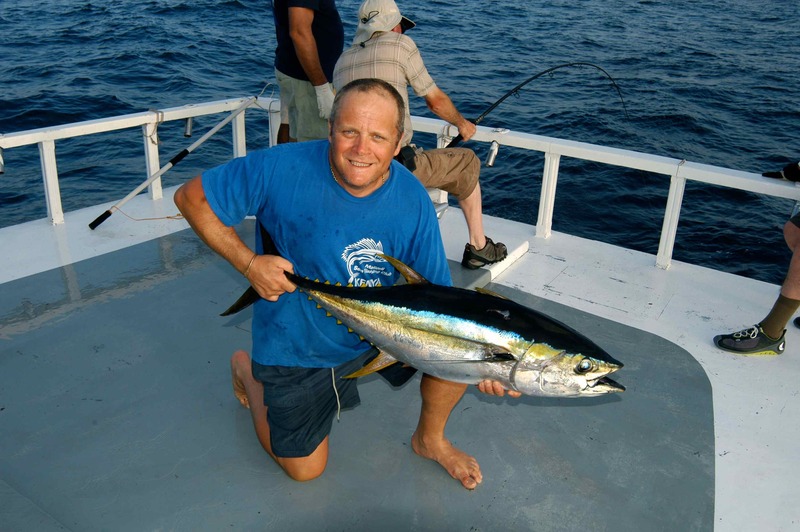 The previous afternoon the jigging outside of the atoll aboard the fishing Dhoni had been superb, we had caught a huge selection of snapper, grouper, jobfish and fierce some dogtooth tuna, for several hours it was bent rods and screaming clutches all round. The crews who had fished aboard our two small skiffs had reported equally good fishing. The two anglers who had fished the outer edge of the atoll had reported several large giant trevally taken on surface poppers. The two anglers fishing the other boat had fished light tackle within the sheltered lagoons and channels that crisscross South Huvadhoo Atoll where we were based, and had notched up an equally impressive tally including beautiful bluefin trevally along with a plethora of other hard fighting species. Also I had the option of being dropped off on that big flat that I knew lay less than a mile to the north, and spending the morning wading some of the cleanest water on earth, knee deep and blood warm. 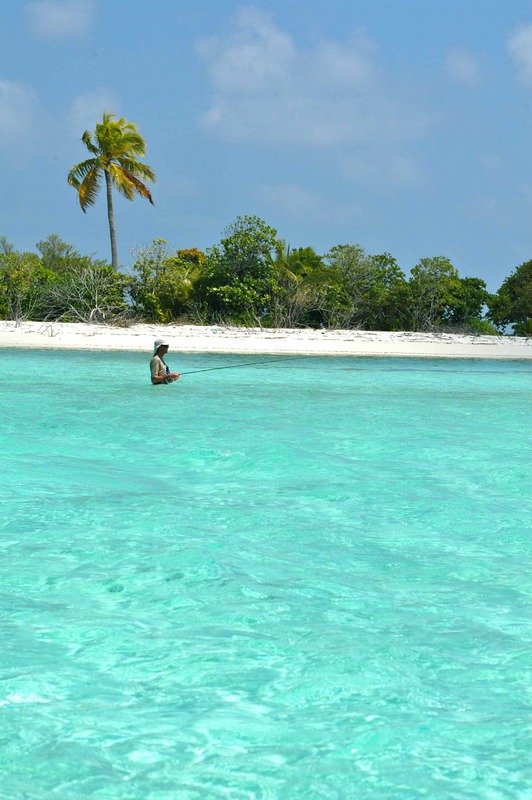 Carrying just my fly rod I could sight cast for the many species of fish that hunt the shallows here in The Maldives. 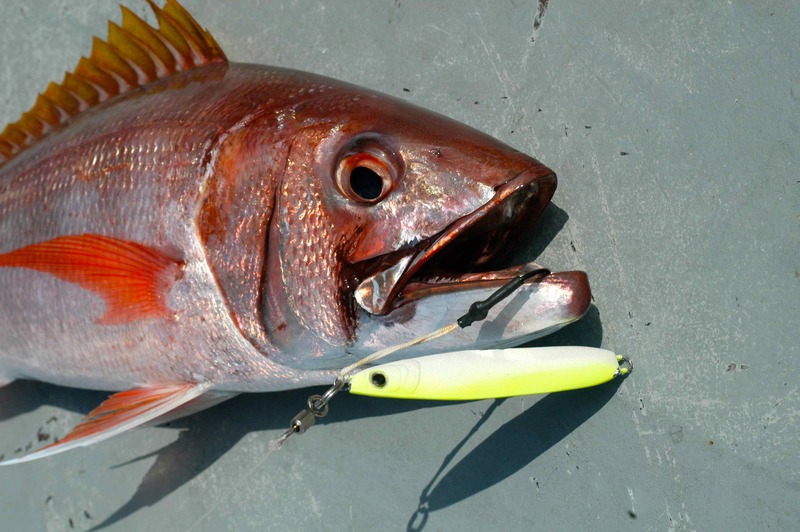 From previous experience I knew only too well how exciting the fight from even a modest trevally, triggerfish or snapper could be on a 9wt; and what of the big bonefish that are known to cruise hereabouts? Yet another option would be trolling surface lures for sailfish, yellowfin tuna, wahoo, dorado or even a black marlin when we decided to move to a new position for the next night: or perhaps I could just chill out, go snorkelling and leave the fishing until after lunch? Less than an hour later and bursting with eager anticipation, I watched as the 250g chartreuse Butterfly Jig fluttered and flicked its way down into the inky blue depths, the single ‘assist hook’ trailing behind in its wake. 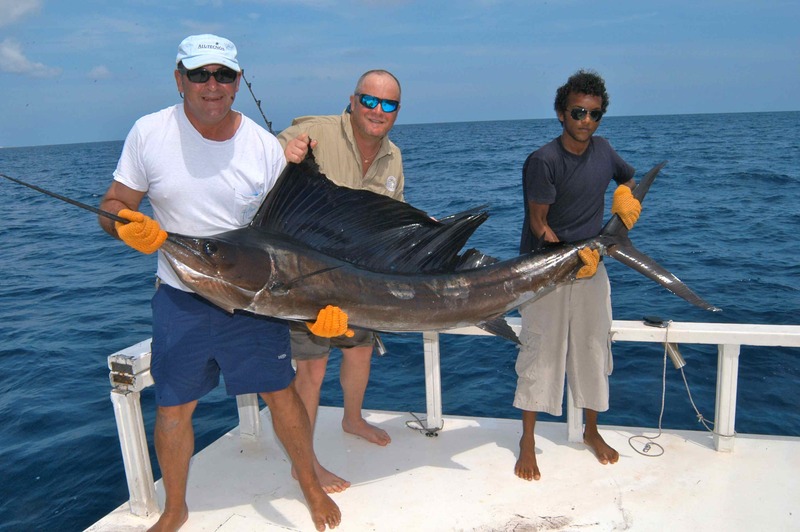 I had decided to spend go out on the Dhoni, popping and jigging, and always I find the first drop or cast on new day exciting, especially so when fishing at some far flung corner of the globe. When finally the little jig tapped bottom some 60m below the surface I eased the lever drag forward to the strike position, took a couple of quick turns of the handle, jigged the rod a few times, wound some more, jigged again, and I was just about to take a few more swift turns of the reel handle when the rod was all but ripped out of my hands! In an instant my jigging rod was bent sharply downwards to what seemed an impossible angle, with yard upon yard of braid getting ripped off the spool, and I’d been silently wondering to myself whether or not I’d set the drag too heavy! For maybe five minutes I slogged it out with that fish, which alternated between reel strong runs and ‘down n’ dirty’ head thumping as it tried to reach the sanctuary of the reef. For a long time I made absolutely no headway whatsoever, then just as I was beginning to think I was on a hiding to nothing, I sensed a momentary reduction in pressure at the other end of the line. Again I pulled back with all I was worth and this time I actually managed to regain a few yards of line, then a few more, and ever so slowly I started to believe that I might actually get to see the fish I’d hooked. Ten minutes later she was hoisted aboard, and I was truly staggered by the size of what I’d caught, not how big it was mind you, rather by how ‘small’ it was! At barely 20lb in weight it was a fraction of the size I’d first imagined, and previously I’d never have thought such a ‘small’ fish would have been capable of putting up such a fight. 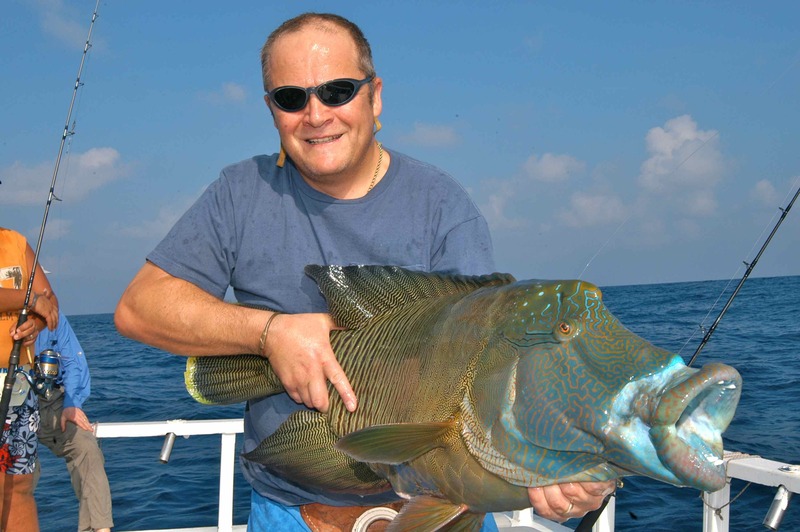 I’d caught a Napoleon Wrasse, an exquisitely coloured tropical beauty that inhabits the fringes and drop off’s of coral reefs found within the Indo-Pacific region. It was a real brute of a fish with ‘Botox lips’, a most impressive set of canine teeth and a face that was painted in the most intricate spiders web pattern of lilac blue, high lighted by a burning fire orange eye. She might not have been big, but she was impressive! Napoleon Wrasse, check out those lips! During the rest of that mornings fishing I personally caught somewhere in the region of a dozen different species, many of which were new to me. I caught my yellow finned grouper, rosy jobfish, coral trout, an orange finned emperor, a tomato rock cod and at least three species of both grouper and snapper at the time I was unable to identify. 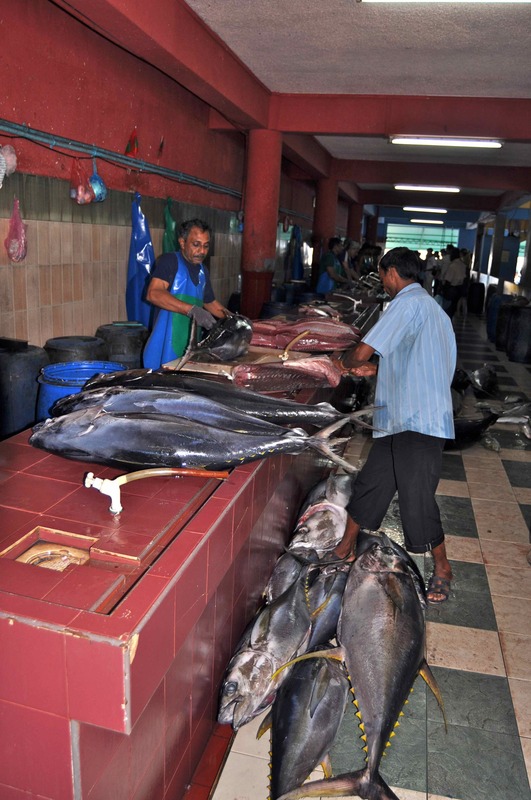 And these were all in addition to the giant trevally, blue finned trevally, black jacks and amberjacks. The trip had begun on a wet and windy February morning at Heathrow, when we boarded an Emirates Boeing bound for Dubai. 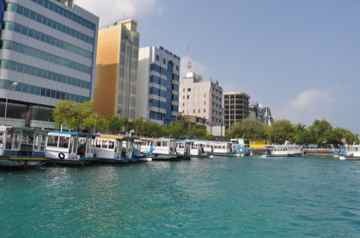 There we switched planes for a second four hour flight south to Male, capital of The Maldives where we boarded a third plane for a final 50 minute hop down to remote South Huvadhoo Atoll, located just a few miles north of the equator at the bottom of this idyllic island chain. Here we were run offshore to join ‘The Sultan of Madivaru’, the luxury mother ship that was to be our home for the next eight days. The plan was thus. 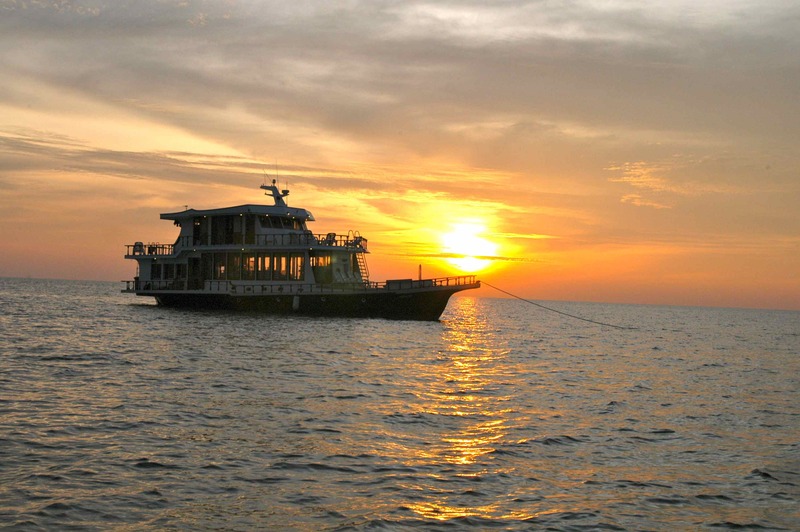 We would sail to various locations around the atoll chain, and anchor in the calm lagoons within the lee of the countless uninhabited islands that fringe the atoll. Fishing would be aboard either the large purpose built fishing ‘Dhoni’, which would venture outside of the protection of the coral reef allowing us to either jig or cast surface lures in the deep blue water along the edges of the drop offs, Alternatively we had the use of two small skiffs in which we would fish mostly within the lagoons and inner fringes of the reef casting spinners of plugs. At the time this was one of my first jigging and popping trips in tropical seas; I was on a steep learning curve. 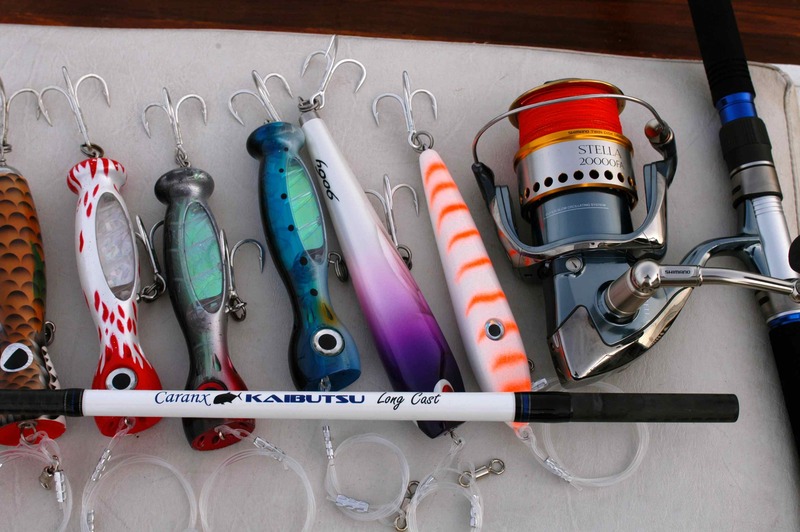 I reasonably familiar with jigging, but casting industrial size surface poppers for the likes of yellowfin tuna, giant trevally and dogtooth tuna, all of which are available in substantial numbers here, was going to be an exciting challenge. Prior to that first trip to The Maldives, never had I seen so many anglers either get spooled or there tackle smashed to smithereens by fish! Can you think of a more beautiful place to fish? Dogtooth tuna were a species I had been looking to catch for some years, and I knew this was a trip that offered the chance of achieving this goal. Another species found exclusively throughout the Indo-Pacific region, dogtooth tuna are not actually a member of the tuna family. Actually they are a species of mackerel, and you only need to look at their sleek profile and formidable array of dentistry to confirm this. I caught my first dogtooth on my first days fishing in The Maldives, though weighing less than 10lb it was a baby. The next day I enjoyed another exciting, action packed session during which I caught several more up dogtooth up to around 30lb, though for a species that often exceeds 100lb and can top 200lb, these were still rather modest specimens. Late in the morning, just as we were thinking of heading back to the mothership for lunch and a siesta, one of the skiffs idled up to us and I was shown a huge dogtooth weighing over of 60lb. 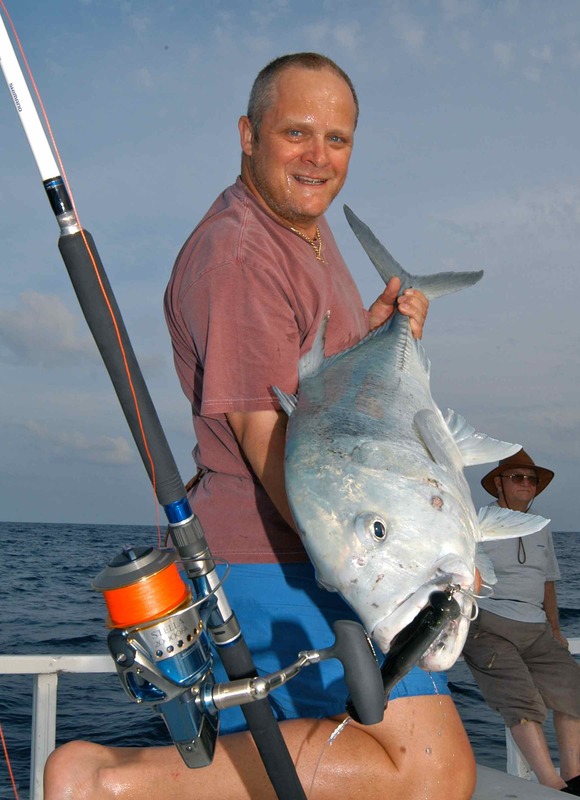 This fine fish had been caught be Frenchman Brice Ferrawdo, who had hooked it casting a popper at the reef edge. The next day I caught yet another doggie jigging, and that fish weighed better than 50lb. 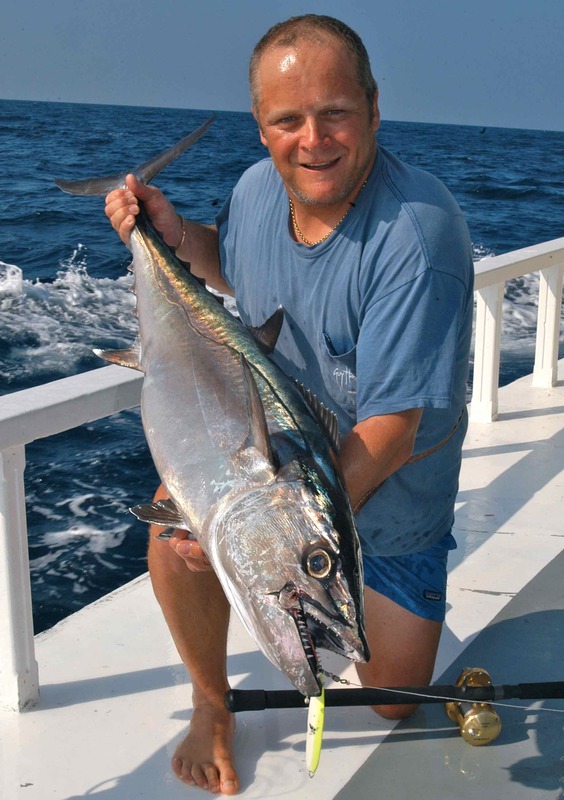 Jigging over tropical reefs really is one of saltwater anglings great experiences. 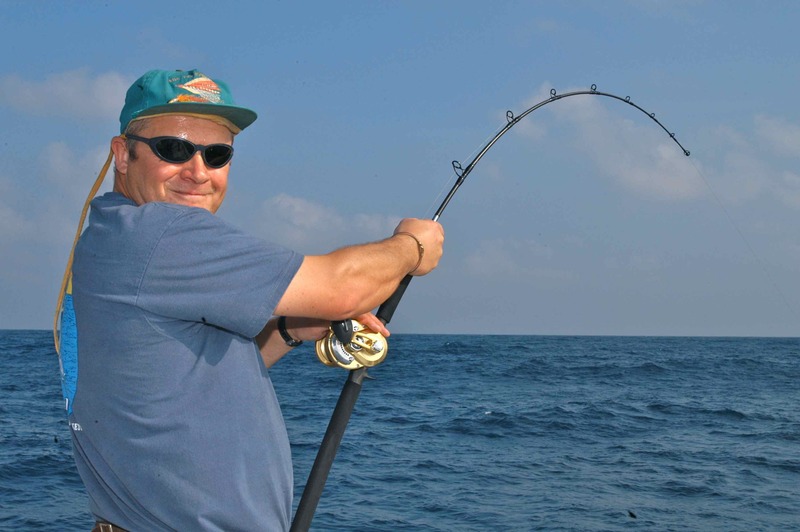 Casting surface poppers in these wonderfully rich seas is equally productive, and certainly not for the faint hearted. Casting up to 12in of shaped timber or plastic, looking to land the lure right into the white water fringe of water marking the outer reef edge, I challenge you to prevent your jaw from dropping wide open when you watch a 50lb Giant Trevally suddenly appear behind the lure and then demolish it in an explosion of white water that has to be experienced to be appreciated. Imagine you are sat sunning yourself on holiday by the hotel swimming pool, when suddenly someone throws a TV set out of a top floor window into the pool, that is what it is like when a hungry GT demolishes your popper off the surface. The fight that follows isn’t pretty, and it certainly isn’t subtle. The rod bends dangerously close to breaking point as the fish rips line seemingly at ease from a drag setting from which it is barely possible to pull line against by hand. Often the fish succeeds in smashing your 80lbBS braid and 200lb mono leader to bits, but when you do successfully boat your fish, the sense of achievement can be positively overwhelming. As soon as you can you launch the plug towards the frenzy and start to crank it back as fast as you can. Takes are truly awesome; an explosion of white water, an arm wrenching jolt and an immediate awareness of an immense power attached to the end of your line as the fish grabs the lure, kicks down a few gears, lights its after burners and screams off. 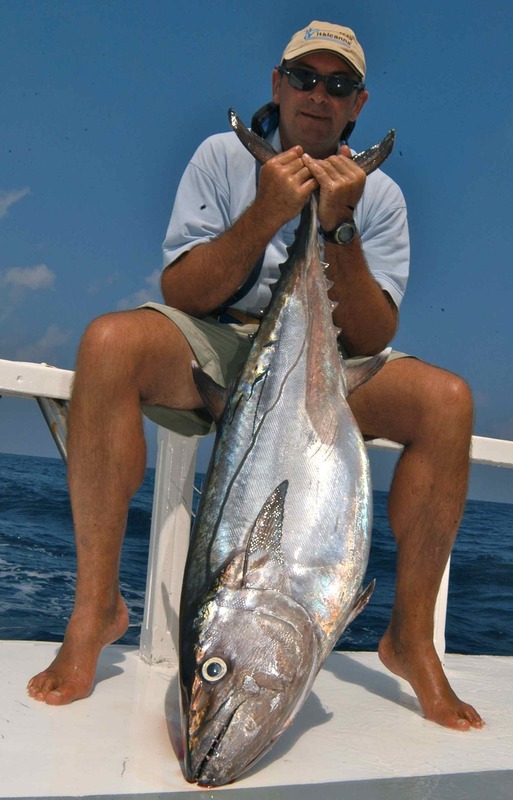 Most of the tuna we caught in The Maldives were in the 30-60lb class, schoolies, yet during that trip I saw one angler brought almost to the point of tears by the shear physical exertion of battling a tuna for the better part of an hour and that was just a 50 pounder, albeit hooked in the tail! Often I am asked if I could only fish one of the many destinations I have been fortunate to fish for the rest of my life, where would I choose? It’s a tough question and one I have to give serious thought too; as there are several countries I’d dearly miss were I never to revisit them. After much though, it’s likely I’d settle for The Maldives. 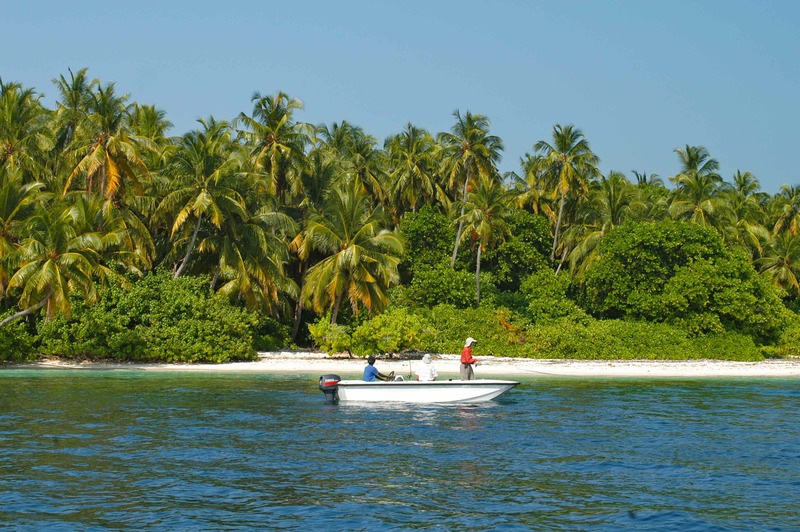 January/February is the best time for southern Maldives.